MIO, MI — The Mio Thunderbolts are known for their dominance on the court, and it all began with the 1978 state semi-finalist squad. Then in 1989, the Thunderbolts brought home their first and last state championship. Now for their 30th anniversary, both teams returned to Mio where memories were made. For current Thunderbolts, like sophomore Drew Hess, remembering Mio’s championship is motivation for a strong season. Kalamazoo college head coach and Mio legend Jay Smith, from the 1978 squad, remains Michigan high school basketball’s all–time leading scorer, a record that has lasted forty years. The 1978 squad is remembered for their regional final win over defending state champion Glen Lake 72-69. That put the Thunderbolts at (23-1) and they finished the season (24-2). Referee Terry Wakeley, who has called games for 54 years, remembers Mio’s 1978 state semi-finalist team. Over ten years later, Mio’s confident team went undefeated (28-0) winning a state title, and now McGregor, who played on that championship team, hopes to bring back another trophy. At the helm for the (2018-19) season, McGregor has led Mio to a (6-1) start. The Thunderbolts only loss was to Oscoda 35-33 on a Brayden Mallek buzzer beater layup. McGregor’s energy and leadership keeps the athletes focused. “As a coach he is super upbeat,” said Hess. “He is always in a defensive stance. You know he wants us to do good things. In 2018, the blue and gold’s season ended at the regional final, and as a freshman Hess landed a spot on Michigan high school’s list for three–pointers made in a single season (2017-18) with 81 in 24 games played. Now Mio returns a strong roster for another year. 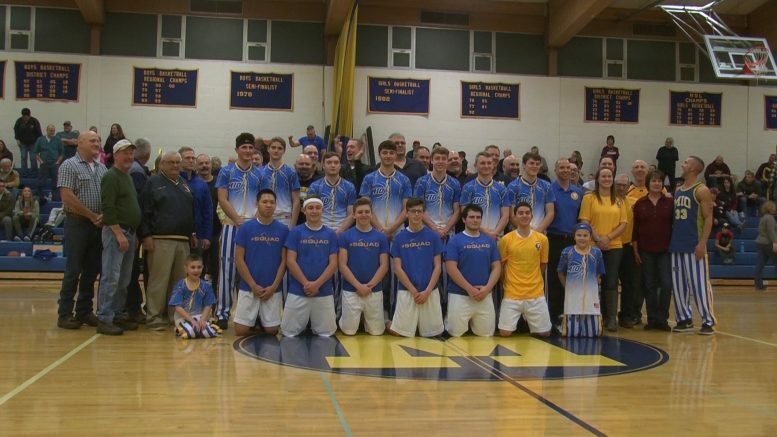 While their skills may have faded, the memories and legacy will never be forgotten at Mio High School. In 1998, the Thunderbolts ended another strong season as the state runner up in Class D.
The current Thunderbolts hope to take their talent to Mio’s fourth states appearance, but it starts in 2019 against Hillman on Friday, January 4th. Two Top Teams Face Off In A Thriller For Our Game Of The Week!